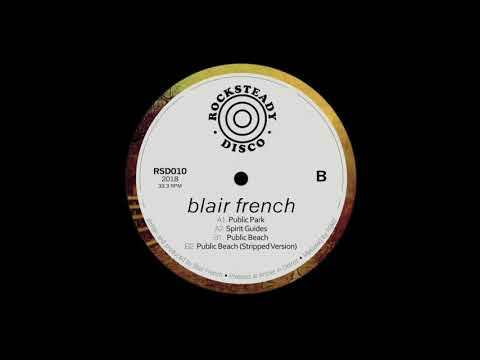 After last year’s phenomenal “Standing Still is an Illusion“ release on Rocksteady Disco that brought Blair French (soundcloud) to our attention, he’s continued to impress us. His follow-up release was put out as one half of Cosmic Handshakes with Todd Modes, entitled “In The Mist“, on Going Good Records. A medley of afro, world and experimental influences, the Detroit natives served up some ear candy with serious replay value. Now, he’s back and once again it’s on the Motor City’s budding Rocksteady Disco. Headed by Peter Croce, the label has shined a light on some fantastic talent, the vast majority of which is local. This is impressive, as not too many labels are focusing on homegrown talent these days and, of those that are, very few seem to be as successful. “Public Park” is the name of Blair’s next release and it leans heavily towards influences coming from the world’s second largest continent. Combining adept sampling with some of his own instrumentation, the EP is diverse yet coherent. Our premiere today is the A1 and title track. Combining all the right elements, from a groovy bass and jangling percussion to a fluttering flute and a playful sounding balafon, this one is meant straight for the peak hours of the dancefloor. It feels like it’s constantly building, only intensifying our need to get out of our chairs and boogie. It’s safe to say this one is going to be in the record bags of many an afro house lover. The EP had a limited advance run of 70 test pressings, each custom spray painted by Blair and Peter which has already sold out. Not to fear though, the official release of Public Park is set to come next week and you should be able to get your hands on a copy directly from the label’s Bandcamp.